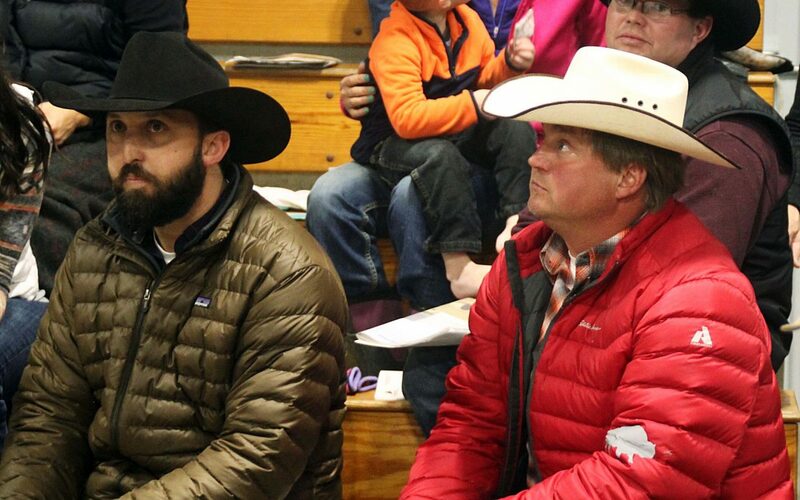 Marty and Justin Edwards, Gillette, WY, repeat Pyramid Beef bull buyers. 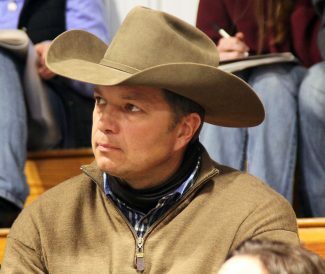 Ellsbury Ranch, LLC, Sundance, WY, Pyramid Beef bull buyers. Simons Ranch, Beulah, WY, purchased Pyramid Beef bulls. Wagonhammer Ranch of Rozet, Wyoming. 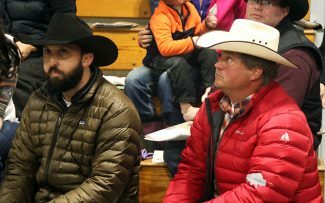 The predictions of heavy snow and major winter storm didn't deter the buyers and spectators from attending the annual Pyramid Beef Bull Sale. 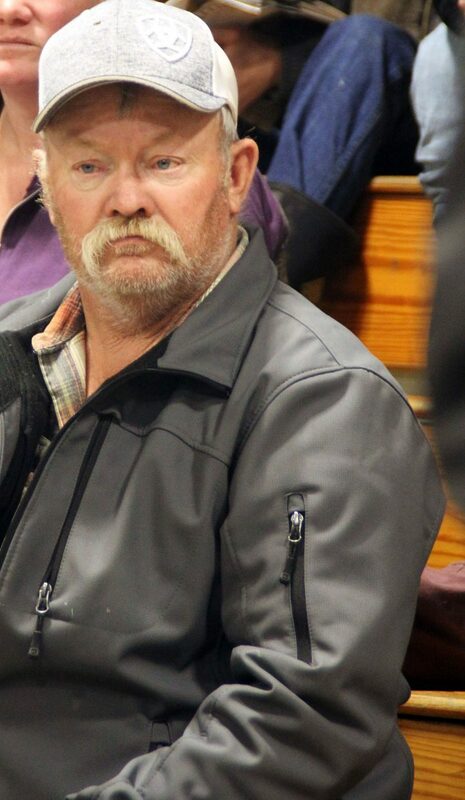 The McLennan and Frederickson families presented a fantastic set of coming 2-year-old and yearling Angus and Hereford bulls along with a great set of commercial bred heifers for the sale. There was a near capacity crowd on hand, despite the winter conditions outside. Lot 64, Pyramid Junction 7043, a 3/11/17 son of Koupal Junction 037 selling to Perel Cattle, Nara Vista, New Mexico, at $20,000. Lot 2, Pyramid Resource 7020, a 2/9/17 son of SAV Resource 1441 to Marty Edwards, Gillette, for $10,000. Lot 3, Pyramid Resource 7018, a 2/8/17 son of SAV Resource sold to Justin Edwards, Gillette, for $9,500. Lot 1, Pyramid Resource 7022, a 2/12/17 son of SAV Resource 1441 sold to Boyd Ellingson, Shadehill, S.D., for $9,500. Lot 104, Pyramid Hometown 7030ET, a 2/13/17 son of NJW 73S W18 Hometown sold to Thorstenson Ranch, Selby, South Dakota, for $16,000. Lot 127, Pyramid Sundance 7148, a 4/17/17 son of Pyramid Sundance 4053 sold to Larson Hereford Farms, Spring Valley, Wisconsin, for $8,250. Lot 128, Pyramid Sundance 7136, a 4/11/17 son of Pyramid Sundance 4053 sold to Justin Edwards, Gillette, for $7,250. The top draft of bred heifers was a group of 15 F1 baldies bred to Pyramid Beef calving ease Angus bull to calve Mar. 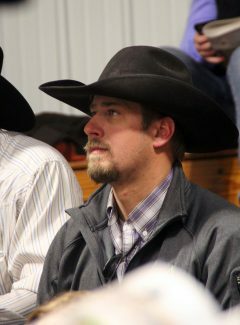 21, to Black Diamond Ranch, Fargo, North Dakota, for $2,000/head. This was the first year they offered a very select group of spring yearling Angus and Hereford bulls, and the younger aged bulls were very well accepted.